EDDIE PRESLEY is a down-on-his-luck ex-Elvis impersonator. With his days of former glory performing in small to medium-sized clubs behind him, he's stuck in a dead-end security job, making barely enough to live out of his van. But Eddie's luck is about to change when he's offered a comeback gig at a seedy Hollywood nightclub...until he has a breakdown on stage and gives the audience a powerful, improvised performance they'll not soon forget. 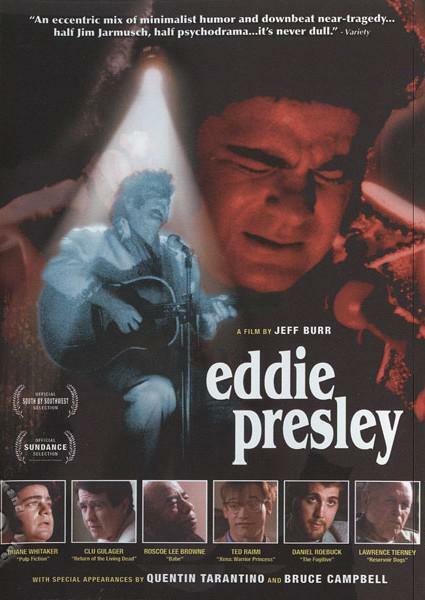 Based on the stage play by star Duane Whitaker (From Dusk 'Til Dawn 2), EDDIE PRESLEY is a bittersweet drama in the tradition of The King Of Comedy and Ed Wood, with plenty of satirical jabs at politics and life at the bottom of the entertainment food chain. Featuring an all-star lineup of genre favorites, Tempe DVD is proud to bring this cult classic from director Jeff Burr (Straight into Darkness, Leather Face) to home video for the first time ever!